Another interesting chase in Macoupin County, IL - an area that has been very good to me this year. 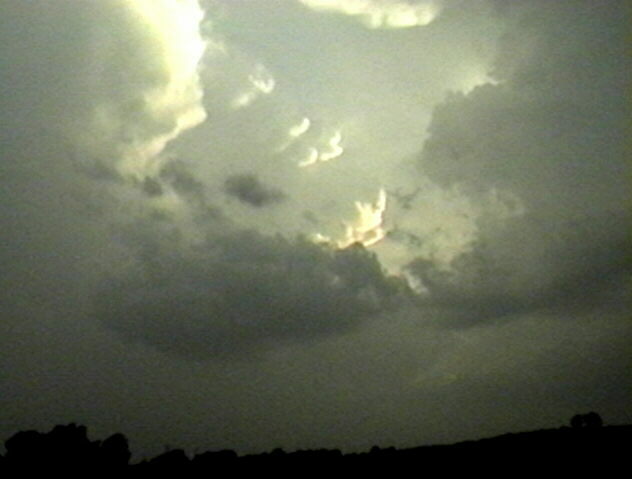 I saw a tornadic storm, several wall clouds, and an apparent rain-wrapped funnel illuninated by lightning after dark. Did not see either of the confirmed tornadoes due to wrapping rain and the need to escape oncoming hail in the case of the first one, and late hour of occurrence after the chase was over in the case of the second one. But a most interesting chase nonetheless. Here is the report, along with some video snaps. Uncertainty about forecast kept me home longer than I wanted to be - there were a lot of possibilities, all uncertain. ETA predicted a high energy-helicity index in SE Missouri, but it was hard to see a trigger. SPC was interested in an outflow boundary across central/southern MO into eastern Kansas. (It never did fire.) There was a cold front to the NW, but south of the Iowa border it was progged to back west as a warm front. All this suggested the possibility of a long drive into questionable chase country, with very uncertain results - so I sat tight. Around 4:00 storms began to fire in NW Illinois and northeast MO, but the closest possible intercept was 3 hours away - so I waited to see if they would backbuild. They were down to Quincy by 5:00, still better than a 2 hour drive with 3 hours of sunlight - questionable at best. Severe T-storm watches now up from just northwest of our area all the way north to Lake Superior, with obvous supercells in Wisconsin. We ate an early supper, then I checked radar again around 6:20. New cell forming along the Greene-Scott Co. line, if this showed signs of intensification the chase was on - I could intercept it in northern Macoupin Co. and still have maybe an hour of daylight. It rapidly intensified, so I grabbed my maps, cameras, and radio and headed out. Alice decided not to go as it had been a long hard day at work. ; she just wanted to rest. I headed out from Edwardsville around 6:40 p.m. An intense storm had quickly developed along the line of Scott and Greene counties. Since other storms had been moving east around 20-25 mph, I figured this would move into NW Macoupin Co. and I could intercept it northwest of Carlinville around 7:30. As I approached Carlinville from the S and E, I could see a rock hard updraft tower leading into a large anvil backsheared to the SW; most of the anvil was drifting off to the E or ESE. It took a little longer than I thought to get in position, but by 7:40 I was northwest of Carlinville and in rapidly improving view of the storm. I had proceeded up I-55 from Edwardsville to IL route 108, west on that to Carlinville, north on 4 about a mile, then gradually northwest on various back roads. I did not know it due to poor radio reception, but by now, virtually all of Illinois from my location north was under a tornado watch. I could see a large wall cloud in the distance by around 7:35. Around 7:40 I stopped about 3 miles SE of Palmyra and watched the wall cloud. At first it seemed attached to the rainfree base to the SW of the precipitation core to my north. Further down the flanking line there was another cell a couple miles WSW of the wall cloud. Just off the flanking line farther to the SW was another large, intense storm, the top of which was really being lit up by the lowering sun. It had a rock hard tower, too, and knuckled anvil just to the north of the tower. I could not see the base of this storm. As I watched the wall cloud it seemed now to be separate from the RFB, which was closer to me, with a clear slot between - RFD? Or maybe there had been a gap all along but I couldn't see it when I was farther away. On reviewing the video, I think the gap was there all the time - the large wall cloud was under a higher RFB to the north of the leading one. In any case, I found out later that there were severe T-storm warnings issued around 7:45 based on radar indications of severe storms near the locations of both the wall cloud to my NW and the knuckled storm to my SW. (All of the warnings that were issued on this storm can be seen here.) The wall cloud briefly shrank, then developed an inflow tail on its east side and rapidly grew. It appeared to reach most of the way to the ground. (This video snap will take a little longer to load than the others - due to limited contrast I didn't convert it to jpeg compressed.) Then, however, rain began to cascade from the base between me and the wall cloud and it disappeared in the time of a minute or two. This would have been around 7:50. I headed west to where 2700N intersects Il route 111 about 2.5 miles S. of Palmyra. I stopped here for about 5-10 minutes around 8:00 p.m. watching the RFB to the west of line of heavy precip that had obsured the earlier wall cloud. Suddenly rising scud appeared, and after a minute or so morphed into a solid lowering that briefly looked like a funnel - but I could see little or no rotation. Then, it evolved into a more typical-looking wall cloud. This lowering would have been near or just southwest of Palmyra. 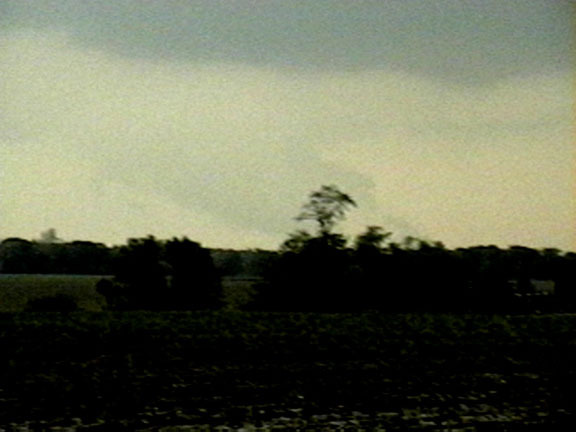 To its southwest, another lowering formed; this one clearly had the appearance of an inflow tail with inflow from the southwest. Again there was a new (and stronger-looking) cell to the west, probably a couple miles SW of Palmyra. Again the wall cloud quickly occluded, and I was faced with an onrushing wall of heavy precip, with who knows what imbedded or behind the precipitation shafts. At the same time, the storm to the SW was threatening to cut off my escape route to the S. I quickly headed south on 111, encountering intense rain in huge drops and perhaps a few small hailstones near Hettick. A new lowering formed on the SW edge of what had been the knuckled storm, just W or Hettick. As it was getting dark, I decided to head east through Carlinville and back to I-55 to head home. I headed on around 8:30, passing through Carlinville. East of Carlinville at 8:45 I noticed a beavertail to my NE, well lit by lightning (the only way I could see it, since it was now totally dark), extending toward the ESE from the heaviest core of the storm. The lightning was now almost continuous - more than a flash a second. I stopped again around 8:50 to watch and tape the lightning. Scuddy lowerings formed on a shelf cloud or RFB to my WNW and, farther away to my NNW, I could occasionally see a large, rain-wrapped lowering. The front edge extended toward the ground at a 45-degree angle; it was wide but I could not tell just at the time how wide - I could only see it 3 or 4 times when lightning flashed behind it; clearly most of the rain and lightning was between me and it. This occurred around 8:55. 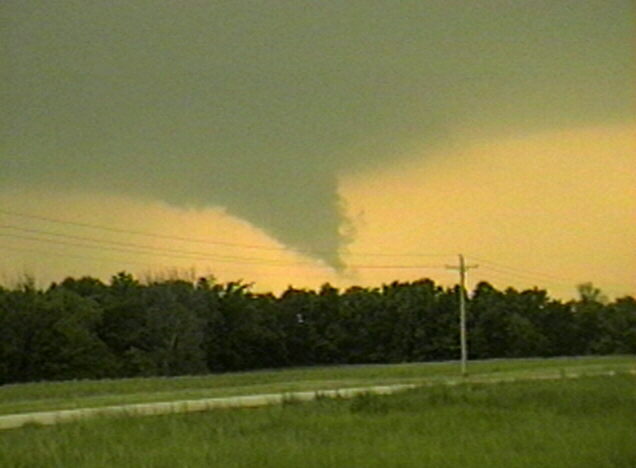 A review of the video suggests what may be a cone-shaped lowering, apparently a rain-wrapped funnel or possibly tornado. The time and place are directly between the two reported tornadoes, so that makes sense. There is, however, no report at this time of a tornado in this location at this time, so funnel is most likely the correct call. Here are two video snaps of this feature taken 3 seconds apart, with some additional info. I should add that I saw no power flashes, just lots of lightning. I heard a statement on the weather radio from STL that radar had indicated a severe storm with a possible tornado approaching Nilwood around 8:50, which also would correspond well with where this lowering was a few minutes later. I watched the storm until about 9:05, then headed home. The storm did, about an hour later, produce a spotter-reported tornado west of Witt, or 17 miles SW of Taylorville. That tornado was reported at 10:16 p.m. Here is a radar image of the storm at 9:50 p.m.
All in all, a very interesting chase for a day when I couldn't make up my mind what to do until around 6:30! There were six tornadoes reported in Illinois; two came from this storm. Total chase distance: about 130 miles. One other thought - for most of its life this storm had an individual, supercell configuration. It was a slow mover, slightly to the right of the west to east movements of other storms. But from around 7:40 to 8:15 it temporarily became multicellular, as storms went up on the flanking line as well as the cell just to the southwest. But these all merged back into the storm - apparently around the time of the tornado east of Palymra - and from about 8:30 to past 10:30, the storm again had the appearance, visually and on radar, of a single large supercell. Later still, it died out in northwest Fayette County after 10:30, but several other cells went up just to the west in Macoupin and Montgomery Counties producing reports of large hail. NORTHWEST OF PALMYRA... MOVING EAST AT 20 MPH. TO AN INTERIOR ROOM ON THE LOWEST FLOOR OR YOUR HOME OR BUSINESS. MILE NORTHEAST OF PALMYRA... MOVING EAST AT 20 MPH. MILES SOUTH OF SPRINGFIELD...MOVING EAST NORTHEAST AT 20 MPH. A TORNADO NEAR WITT... MOVING EAST AT 20 MPH. COMMUNITIES STILL IN THE PATH ARE WITT...COALTION...AND NOKOMIS.